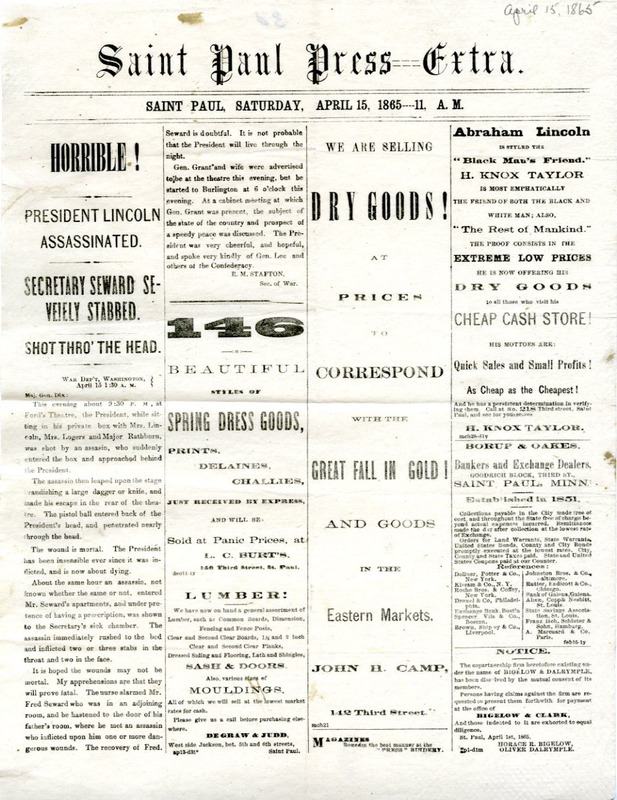 This single sheet of the St. Paul Press, dated April 15, 1865, announces the assassination of President Lincoln. There are several odd things about this; it was found in a manuscript collection, not in the run of the newspaper. There is no extra in that; was this a contemporary commemorative piece? Was it something done late that very day? Its size is not standard paper newspaper size either; this is 12.5" x 9.5" The whole of the page is included here to show that even in the midst of the Nation's sorrow, ads were included. Use of this item for research, teaching, and private study is permitted with proper citation and attribution, as Joseph A. Wheelock and family papers, Minnesota Historical Society. Reproduction of this item for publication, broadcast, or commercial use requires written permission. For permission, please see this web page.